BlackBerry’s new smartphone, a touchscreen device called Z10, has finally gone on sale. The device is the result of a metamorphosis at Canada’s iconic tech company. “We have our innovation mojo back,” says CEO Thorsten Heins. A visit to the company’s headquarters in Waterloo. The contours of the old company logo are still visible on the sparse, black-and-white buildings in a snowy business park on the outskirts of the Canadian city of Waterloo. But the former ‘RIM’ on the facades, short for Research in Motion, has been replaced with the name the smartphone maker is better known for around the world: BlackBerry. ‘Forget RIM’ is the message of the new management of the technology giant. Forget the company founded by Mike Lazaridis, the inventor of the BlackBerry that grew turbulently in the past 10 years from humble beginnings to a world leader of mobile e-mail. Forget especially the sleeping giant that raked in billions while it was mercilessly overtaken by smartphone producers with more advanced devices, such as Apple’s iPhone and the Samsung Galaxy. BlackBerrys are now made by BlackBerry. On the production line in Waterloo, hundreds of employees are working on the assembly of the BlackBerry Z10, the completely new smartphone that runs on the brand new operating system the company has developed over the past few years, BlackBerry 10 or BB10. The workers in the plant, a very multicultural group, are quickly installing parts of the devices, and carrying out tests. The atmosphere is positive. 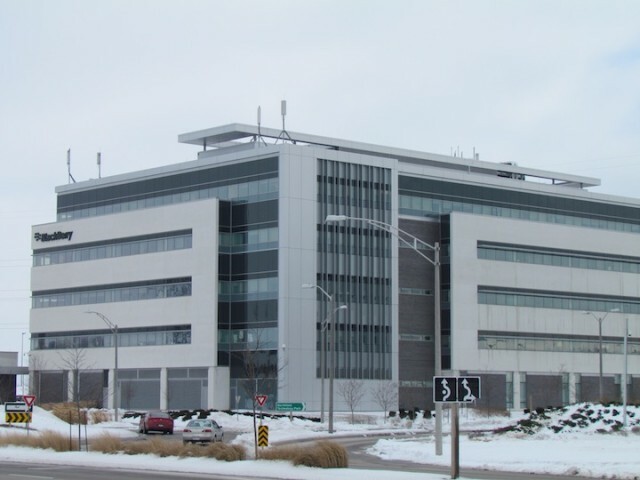 Business park of BlackBerry on the outskirts of Waterloo, Ontario. 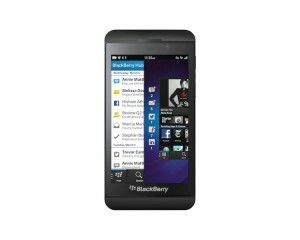 The new BlackBerry, a smartphone with a touchscreen, is now available in most world markets. A model with the familiar QWERTY keyboard, Q10, will follow. With the new devices, the former RIM hopes to make a fresh start in the smartphone sector. The Canadian star company, once a leader on the world market it helped create, has only about 5 per cent of global market share left, far behind rivals Apple and Android. BlackBerry 10 should not only help to halt the downward trend, but also reposition the company as an innovator in the field of mobile computing, says CEO Thorsten Heins. “We understood that if we want to help create the future, we had to do something really dramatic, and that was building the new platform,” he says. Second chances are rare in the constantly changing mobile industry, however. So the company has had to make some drastic changes to stave off demise. In addition to the name change and a reorganization in which 5,000 of 16,000 employees were laid off, RIM’s management was replaced with an entirely new team. The former co-CEOs, Lazaridis and Jim Balsillie, made way for Heins early last year. The two ex-bosses have both severed ties with the company; Lazaridis resigned as director last week, following Balsillie, who resigned early last year. Heins, a German who previously worked for Siemens, put together a new team with a more international outlook than the old group, which was sometimes dismissed as too small-town Canadian, and too little technology multinational. Kristian Tear, a Swede, was recruited from Sony Ericsson to become chief operating officer. Frenchman Frank Boulben, a former executive with Vodafone and Orange, is the new marketing director. You could say BlackBerry has become a smartphone company with a European outlook. The corporate culture has also been overhauled, starting with RIM’s reputation for being an arrogant, closed organization. Lazaridis and Balsillie had such global success that they came to consider themselves invincible and doggedly carried on with their success formula while the world around them changed rapidly. They didn’t take criticism well. Now, BlackBerry’s aim is to be “more open than anybody else,” according to one executive. Although Heins can come across as stiff, he exudes a boyish enthusiasm and does his best to answer every question politely. The most famous miscalculation of the old leadership was to dismiss the iPhone as a toy at the time of its launch by Apple. Corporate users, almost all on BlackBerry at the time, would have no use for frivolous features like a camera or a music player, they scoffed, let alone the many apps that soon came to define the mobile market. 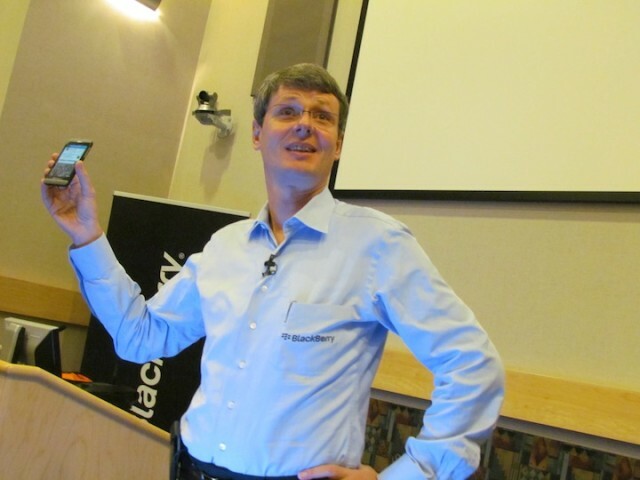 BlackBerry CEO Thorsten Heins holds up a new Z10 device. That attitude is gone in Waterloo. The BlackBerry 10 includes modern camera technology and other gadgets. Moreover, the company has invested a portion of its considerable cash reserves in the improvement of ties with app developers. App makers did not bother to make versions of their software for BlackBerry, first because RIM made too many different devices, each with its own screen size, and later because BlackBerry’s market share was negligible compared to iPhone and Android smartphones. Thousands of free BlackBerry 10 prototypes were handed out to app developers to encourage them to make software for the platform. The company also provided financial incentives. That helped: there are now more than 100,000 apps for BlackBerry 10 – a respectable number for a new operating system, although it is still a fraction of the number of apps available for iPhone and Android. In general, the new BlackBerry technology has been well-received, with praise for the ability of the operating system to switch back and forth between various applications. But it remains to be seen if the company can not only hold on to old clients, but also attract new customers. According to Heins, the reorganization and new technology have allowed the company to “get to the starting line”.